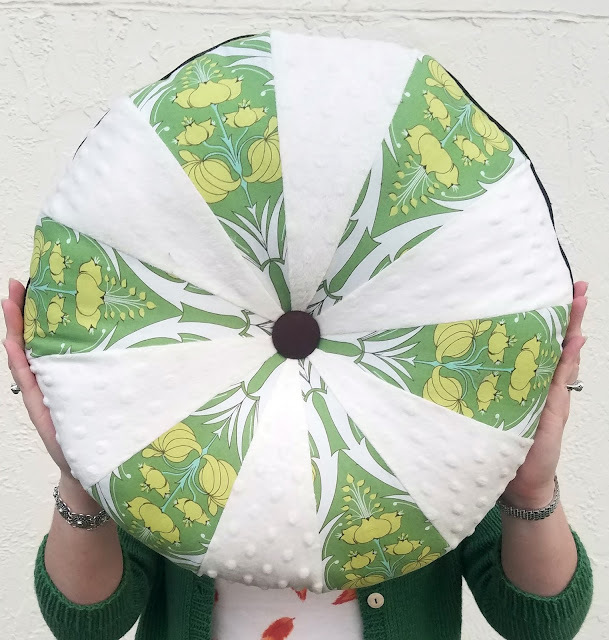 The desire to make this actually began a week before when I was scrolling through Creativebug and saw a class for this cute cartwheel pillow. I was knitting my Salal that night, so I decided to watch the class while I worked. Of course seeing that the pillow was easy and super cute, I decided I wanted to make one. I tried to justify a family member getting one for Christmas, lol, but in the end I restrained myself in that way. I still wanted to make one up, but I did not need any extra pillows on any couches or beds in my life. But Bert being a little cat and new in my household could be a justification, right? Especially when we sent him off to have his eyeball removed - you should really get some kind of consolation prize for that type of thing, right? Right. It was enough justification for me, so I rifled through my stash to find appropriate fabrics that weren't too girly (easier said then done in my stash) and I set to work. 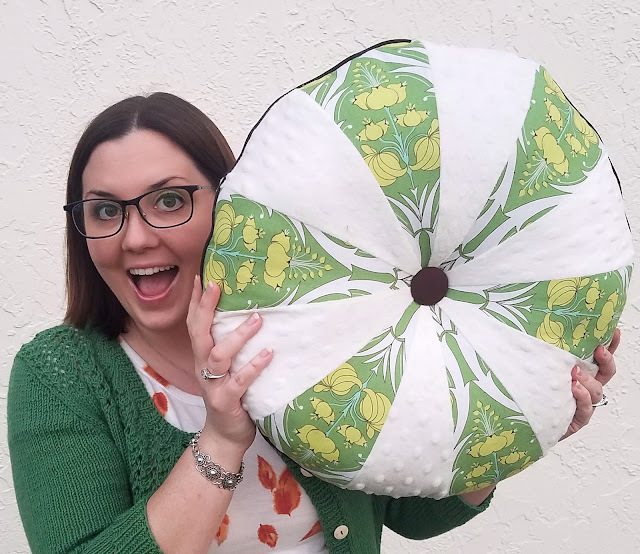 I knew I wanted to make at least one spoke of the pillow in minky fabric. In observing other people's cats it seems that something about that silky texture just gets them really jazzed up. I happened to have 2 partially cut remnants of minky in my stash from a thrift store bucket of fabric I bought years ago. The previous owner clearly cut a blanket back worth out of the pieces, leaving me with the outer edges of the fabric width as well as a thicker area at the end of their yardage that was larger then they needed. Since this pillow was made entirely out of pieces together long triangles, I was able to use the skinny scrap area and cut out lots and lots of pieces. 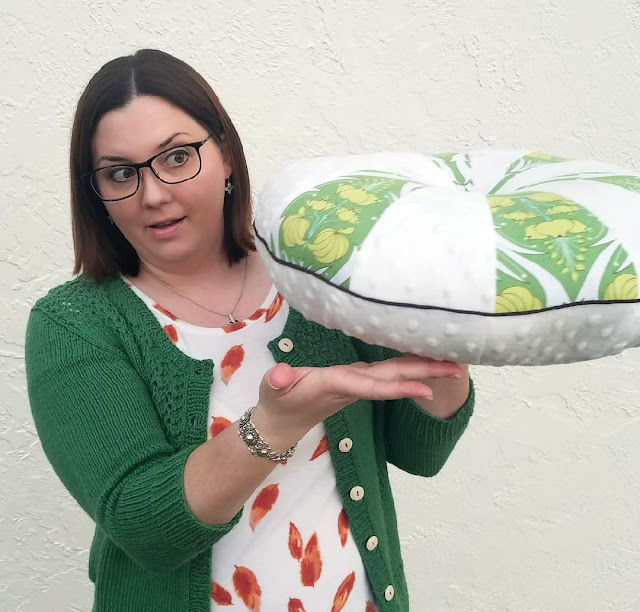 I picked this green Amy Butler fat quarter to go with the minky since it was pretty but not crazy feminine looking. The class tells you that you can get 7 triangle pieces out of a fat quarter, and that is exactly what I was able to fit. Not finding any other patterned fabrics that I felt coordinated with this one, and having accidentally cut 22 pieces out of the minky before I realized I might have too many, I decided to just stick with these two fabrics for a simplistic look. I figured since one side would be against the floor anyway, why not make it simple? I actually really like the look now that it's finished. 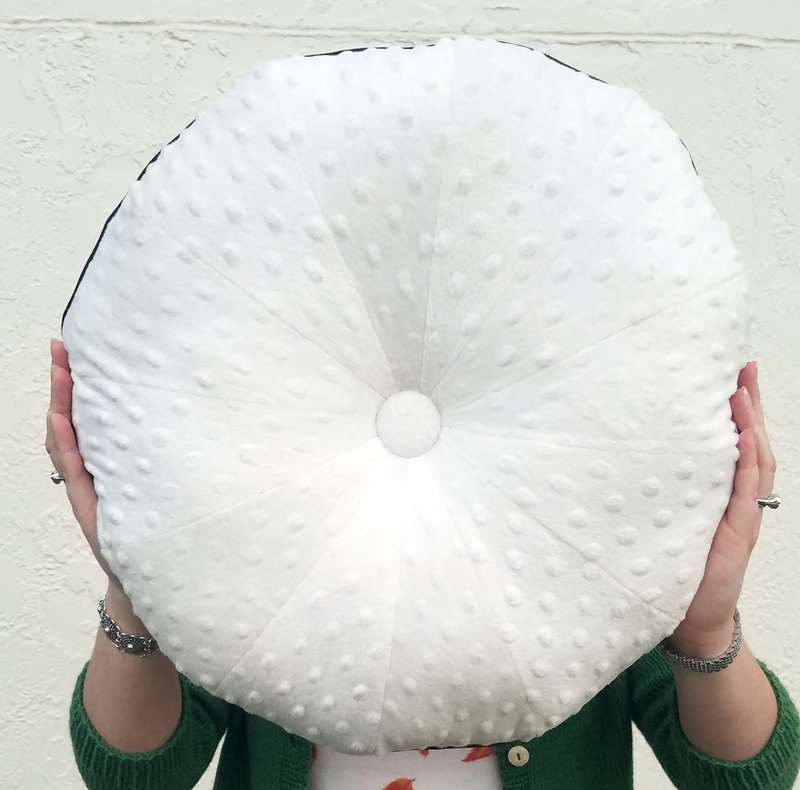 The class shows you step by step how to construct every aspect of this pillow, giving lots of good tips along the way. I'm not much of a quilter (I get bored, to be honest), but this was entirely palette-able quilt piecing to me. My front and back came together with no problems. I wanted to go with brown for the button and the piping, and luckily I had some premade bias tape on hand from a random thrifting excursion. I tend to grab packets of rick rack and bias tape all the time, and happily that worked in my favor with this project because I didn't have to make any, lol. The piping is a bit skinnier than the one shown in the class, but I still like the look of it. Once the pillow was piped and put together, I started stuffing. I stuffed and stuffed and stuffed ... and then ran out of stuffing when I was almost finished. Ugh. The only place near me with polyfil was Walmart, and not wanting to run out again EVER I grabbed a 50 oz bag, lol. I could stuff a few more pillows now should the mood strike me. Anyway stuffing this was interesting, and as you can see my pillow is a wee bit lumpy. This is partly due to the fact that I forgot to interface my fabric before sewing it together (oops), partly because it's difficult to get something with flat sided pieces to look rounded with fluff, and partly due to this already being laid on and played with by a small kitten. So this is a partially used pillow and I'm now worried about it being a little lumpy here, lol. It's a cat bed, after all, and he has yet to complain. Once the pillow was stuffed, I covered my buttons - one side with brown cotton and one side with minky - and attached them according to the video. It was a wrestle, for sure, but I think it came out nice. I like the amount of tufting I achieved and Bert likes to boop the button like it's going to turn something on, or attach it and try to smack it off the pillow (which it thankfully has not done). I brought the pillow with me when I picked Bert up the next day - just in case, lol. He was a bit too freaked out to care. When I got him home, though, after he had settled in I set him on the pillow and he decided to cuddle up and rest on it for a minute. I was elated! lol A pet that actually somewhat liked something I offered to him! What a novel idea. My other cat could care less about anything other than her dry food bowl being full and being let out on the porch at her leisure. I've bought her a bed, a scratching post, countless toys, treats, you name it over the years, all of which have been met with the same steely stare and turn away to sit on the floor in the sun. But Bert really seems to like this pillow. He plays with the button, he bats things around the outside of it, and sometimes he even sits on it. Hoorah! This was him in the vet's office. He definitely did not like all the noise and travel. I had to bring him to work with me for a few hours, and he quickly found an extremely hidden corner and hunkered down until we could get him home. Once we were home, I fed him (which he very much enjoyed) and then he proceeded to run around and explore things just like nothing had changed :) You would seriously never have known this cat just had any surgery except for his shaved head and stitched eye, lol. All my pics from that day are blurry because he just wouldn't stop moving. You can see his shaved forehead and eye area in the above photo though. Now Bert enjoys lounging in our bed with us as the sun comes up - that is if he's not attacking our feet in the early morning light. We thought the surgery would take him down a peg (especially because we had him neutered at the same time), but he's just as playful and bite-y as he was before. This photo above was taken the week he came home and he was particularly snuggly. You can see his short haired forehead in the pic too, lol. And this picture was from just a few days ago. He particularly loves to snuggle up around out legs. See how good his eye looks? Now that his fur is growing back, it looks like nothing ever happened. His stitches are still there, but they are self dissolving and should come out in the next few weeks. He's a super cute little guy, and he has a crazy side too, so he fits in great in our house. I am so happy to see he's doing well :-) Thank you for updating us!